Emergency Medicine is rapidly changing and to help you keep on top of new and exciting ideas we have selected some useful FOAMed articles for our users. FOAMed is a collection of constantly evolving, collaborative and interactive open access medical education resources being distributed on the web with one objective — to make the world a better place. Approximately 80% of strokes are ischemic in origin leading to significant morbidity and mortality worldwide. In ischemic stroke, there is usually a core infarct and an ischemic penumbra. The penumbra is the area that we try to salvage with reperfusion therapy. Currently, systematic intravenous alteplase administered within 4.5hrs after symptom onset is the mainstay of therapy, however many question its risk/benefit ratio in ischemic stroke. 4.5 hours is a narrow therapeutic time window and many contraindications such as recent surgery, coagulation abnormalities, and history of intracranial hemorrhage inhibit many patients from receiving systemic thrombolysis. 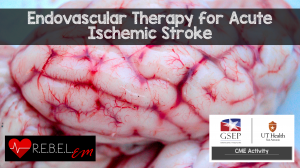 There have been many studies evaluating endovascular therapy in the management of ischemic stroke published in the past few years. This post will serve as a review of those studies. A medical student who has just returned from their elective in Nepal presents with 1 week of bloody diarrhoea. He had been in the lowlands and stayed with a family in the local village. 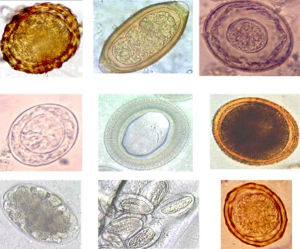 The diarrhoea started three days prior to leaving Nepal, but is getting worse. He is now opening his bowels 10x a day with associated cramps, fevers and has started feeling dizzy. 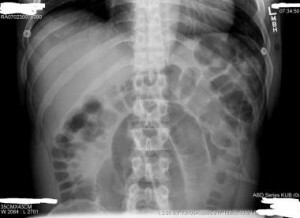 A 63-year-old female presents with abdominal pain, decreased bowel movements, nausea, three episodes of vomiting, and abdominal distension. She has a history of prior hysterectomy, appendectomy, and cholecystectomy. She has been unable to keep food down. This has never happened before, and she denies fevers, changes in diet otherwise, night sweats, or other medical problems. Triage vital signs (VS): BP 123/61, HR 107, T 98.9 Oral, RR 22, SpO2 97% on RA. Physical exam reveals a patient who appears uncomfortable with abdominal distension. Her abdomen is diffusely tender, but she displays no peritoneal signs. The rest of her exam is normal. What is the patient’s diagnosis? What’s the next step in your evaluation and treatment?